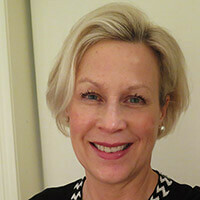 Carol Besler covers watches and jewelry worldwide. Like the minute repeater, tourbillon and the perpetual calendar, the equation of time is a rare and valued complication. 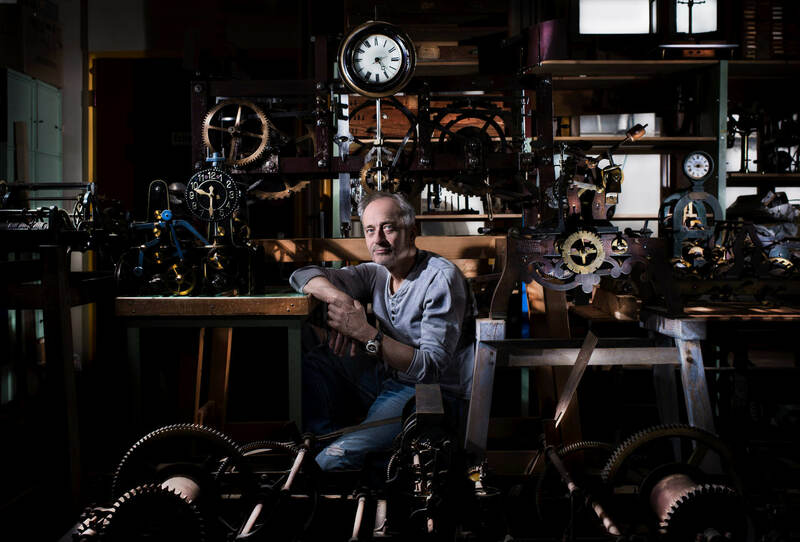 True, it is an arcane function that neither chimes the hours, nor fights the effects of gravity, but it is rooted in the history of watchmaking and is therefore meaningful for aficionados. The equation of time tells us the solar time – the amount of time it takes the sun to return to its original position in the sky each day, which on average does not vary significantly from real time (no more than 16 minutes). For practical reasons, man has divided each year into 365 and a quarter days, each day into 24 hours, and the hours into 60 minutes each. However, because Earth’s orbit is elliptical rather than circular, the time in relation to the sun varies daily. It is exactly twenty-four hours long on only four days: April 15th, June 14th, September 1st and December 24th. Because these variations occur identically on the same dates, they can be programmed into a watch movement by means of a simple cam making one complete rotation a year. The cam is usually linked directly to a perpetual calendar, so the display of the equation of time always corresponds to the current date. Of the two ways to display the equation of time, the method most true to its name is the inclusion of a subsidiary dial or arc, graduated from -16 to +14 minutes to indicate how many minutes you should add or subtract from mean time to get the actual solar time – in other words, it’s an equation or calculation. 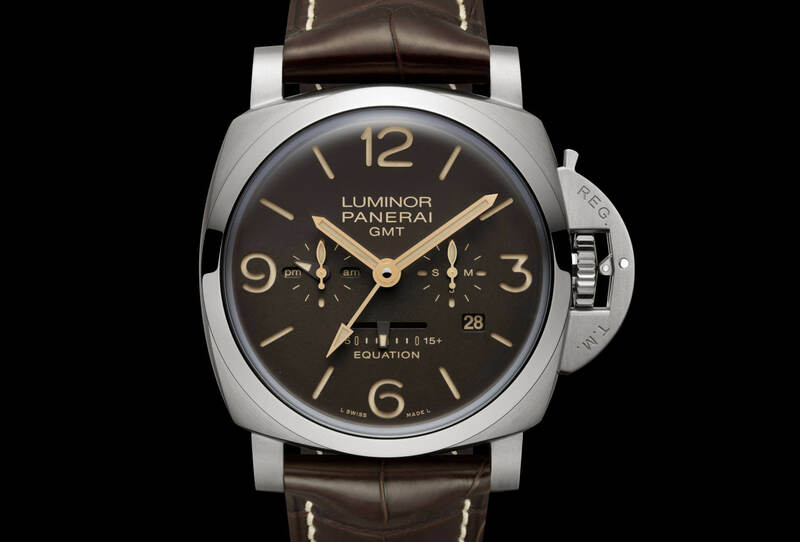 A recent example of this is the Panerai Radiomir 1940 and Luminor 1950 Equation of Time special editions, introduced at the SIHH in 2015. 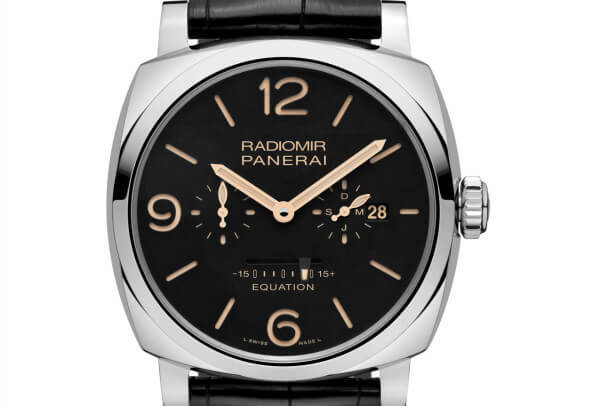 Both use linear scales rather than an arc to show the variation, placing it along the bottom of the dial where Panerai often places a power reserve indicator. The other way of showing equation of time is the marchante or “running” equation of time, which is not an equation, since it does not involve a calculation. Rather, it is a running indication of solar time that makes the difference instantaneously visual. The solar hand is also on the central dial and often differentiated by a sun motif at the tip. You can watch the two hour hands align four times a year and then drift apart again. 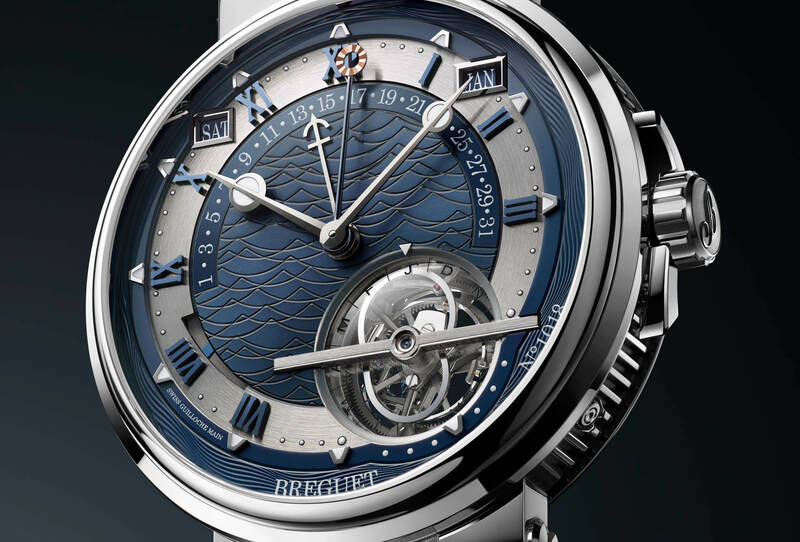 The most recent example of this is the Breguet Marine Équation Marchante 5887, introduced at Baselworld in March. It is unusual in that it displays the cam that controls the equation of time function – it is shaped like a figure eight, and visible through the same window that displays the tourbillon carriage. 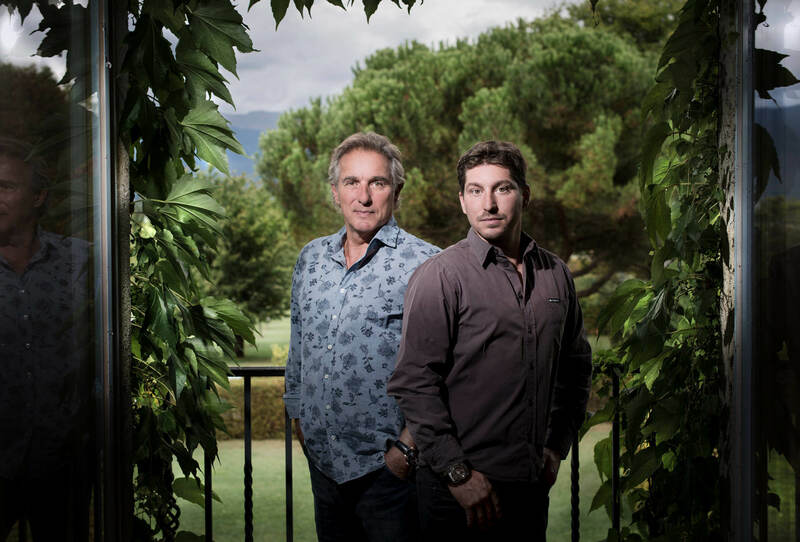 It runs on a sapphire disk so as not to block the view of the tourbillon. The watch is a triple complication that includes a perpetual calendar that also indicates the date from the center position: this fourth central hand is tipped by an anchor motif in honor of marine chronometers, and indicates the date on a retrograde scale just inside the hour and minute scale. The result is a complicated, four-handed watch that nevertheless looks fairly clean and uncomplicated. In keeping with Breguet’s marine theme, the inner dial is engraved to resemble waves. The self-winding Calibre 581DPE runs at 4Hz and includes a 60-second tourbillon with a titanium carriage and a silicon balance. 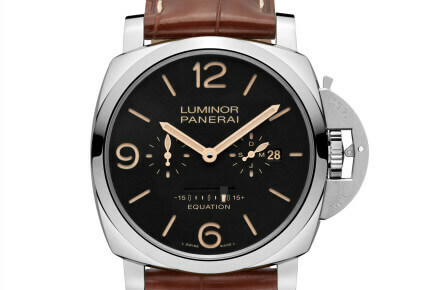 It has an 80-hour power reserve, the status of which is displayed in a very subtle aperture between the 7 and 8:30 positions. The watch celebrates Abraham-Louis Breguet’s appointment in 1814 as a member of the Bureau des Longitudes in Paris, a group of experts who measured Earth’s physical properties. As the official marine chronometer maker to the French Royal Navy, Breguet was a key member of the group. A peripheral rotor allows the movement to be seen through the caseback, including bridges engraved to depict the Royal Louis, a ship in the French Royal Navy, and a barrel engraved with a windrose motif. The fluted case band, a signature feature of the Marine collection, is more widely grooved than in previous watches in the collection. Vacheron Constantin also introduced a marchante-style equation of time earlier this year in a watch totally dedicated to astronomical functions. 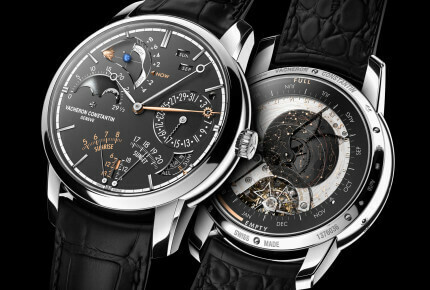 The Cabinotiers Celestia Astronomical Grande Complication 3600 is the most complicated wristwatch Vacheron has ever created. Twenty-three complications are integrated into the movement, the manual-wound Calibre 3600, which was five years in the making. It incorporates six barrels powering three dedicated gear trains: one for civil (mean) time, one for solar time (on a sun-tipped hand) and one for sidereal time – using the stars instead of the sun as a reference, which varies from mean time by about four minutes a day. Sidereal time is shown on the back of the watch. The Celestia is also a perpetual calendar, and tracks moon phases, tide levels, zodiacal signs, seasons, solstices and equinoxes. A mareoscope depicts the alignment of the sun, moon and earth. On the caseback is a celestial chart with the Milky Way, constellations of the Northern Hemisphere, and a power reserve indicator. 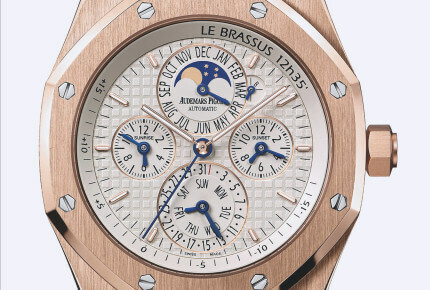 It also has a sunrise and sunset indicator, which is a rare complication. 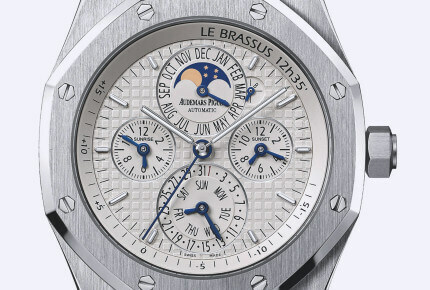 The first wristwatch with a sunrise/sunset complication was made by Audemars Piguet in 2000. The Jules Audemars version was a perpetual calendar with a traditional equation of time that uses a central hand to track the difference with civil time on a scale that runs dramatically between 4 o’clock and 10 o’clock. In 2010, Audemars Piguet made the same complications in a Royal Oak model, which is now in the current collection. It is unusual to see this traditional complication in a sporty case with the tapisserie dial, but the design really works and the fact that is available in a steel version makes this complication more accessible. 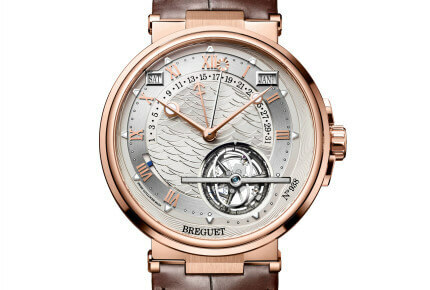 One of the things that makes equation of time watches so valuable and collectible is their rarity: while many brands make tourbillons and minute repeaters, only a handful make an equation of time, including Breguet, Vacheron Constantin, Patek Philippe, Panerai, Zenith, Ulysse Nardin and Audemars Piguet.